He can always go lower. And they will always let him: the voters who made Donald Trump president, the Republicans terrified of crossing them, the lap-dog pundits. What they condemn in others is in him ignored, excused, sanctified. So now the president has been obsessively attacking a man who, even seven months dead, is more decent and courageous than Trump could ever be. He has lied about John McCain’s record on veterans, whined about not being thanked for the senator’s funeral, and distorted McCain’s role in the Russia investigation and his vote on a bill to repeal Obamacare. As long as Senator John McCain lived, he was a testament to the limits of Trump’s power, and of his character: McCain’s heroic service in a war Trump avoided, his refusal to indulge the president’s infatuation with Vladimir Putin, his outspokenness about the traditions and integrity of the Senate, embodied in that thumbs-down vote in the chamber — it all diminished a president utterly consumed by narcissism and insecurity. McCain being dead doesn’t make Trump feel better. So he desecrates his memory. Disrespecting the military, it seems, is inexcusable only in black men who kneel on football fields. Trump delights in cruelty. Chaos is his comfort zone. There is no grand plan, no strategy beyond the aching need for attention and the pathetic pose of toughness. Makers of “The Apprentice” grappled with this, reverse-engineering Trump’s capricious judgments and wanton acts of cruelty in the editing room to make it seem like there was reason at work. There wasn’t then, and there isn’t now. A handful of Republicans defended McCain against Trump’s attacks last week. But most of them did it by praising McCain rather than criticizing Trump directly. Erstwhile Trump critic Senator Lindsey Graham, to whom McCain was a dear friend and mentor, was unconscionably measured: He doesn’t like how the president talks about his friend, he said, but he still likes the president. We know better by now than to wonder if this, at long last, will be too much. Nothing Trump does is ever too much. He was right when he said he could shoot somebody on Fifth Avenue and lose no votes. The South Carolina senator, like so many Republicans, has done the math. He needs Trump and the voters who love him, not just to remain relevant, but to survive politically. He and McCain had been down this rutted road long before Trump ran for president. South Carolina’s 2000 Republican primary was ugly. Supporters of eventual nominee George W. Bush spread rumors that McCain was the biological father of the Bangladeshi child he and his wife, Cindy, adopted; that Cindy was a drug addict; that McCain betrayed his country in Vietnam, where he was held as a POW for five years and tortured. But by 2008, McCain, too, had done the math. He reversed himself on signature issues. He allowed tactics he had deplored in South Carolina, his campaign casting Democrat Barack Obama as less than American, friendly with terrorists, not to be trusted. Hatred crept into rallies, fanned by Sarah Palin, the know-nothing VP pick he inflicted on the world. She spat out “mainstream media” the way Trump shouts “Fake news!” Her fans menaced reporters and called for violence. McCain couldn’t contain it. In that signal moment when he took the microphone from a woman who said Obama was a scary Arab — “No ma’am, he’s a decent family man,” he told her — the crowd booed him. 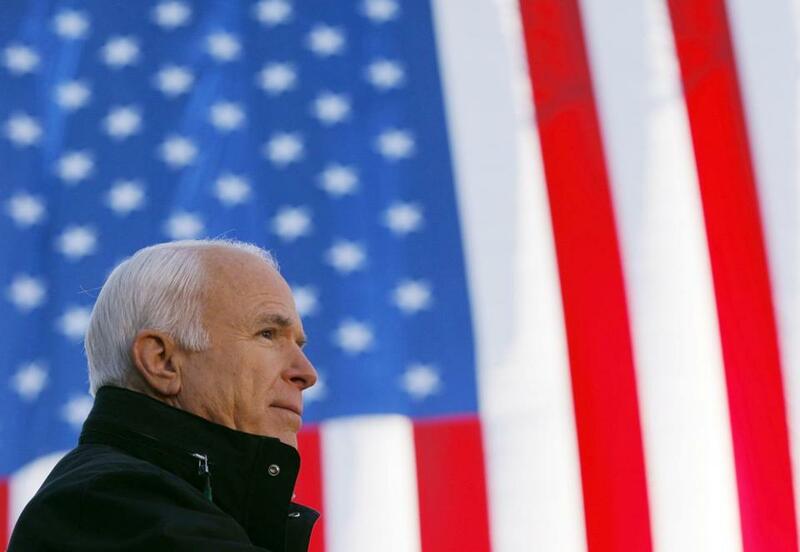 The Republican Party did not belong to men like John McCain any more. And it has strayed even further from him since. So far that a sitting president can spend days attacking a dead man with near-absolute impunity. We’ll learn even more about the depths Trump has plumbed, as details of the Mueller report emerge. But we already know the certain outcome. He always gets away with it.